Bought this bed frame for my college age son. It arrived earlier than expected, bonus. He put it together without any problems. It looks great! Would buy this again. Thanks Overstock! 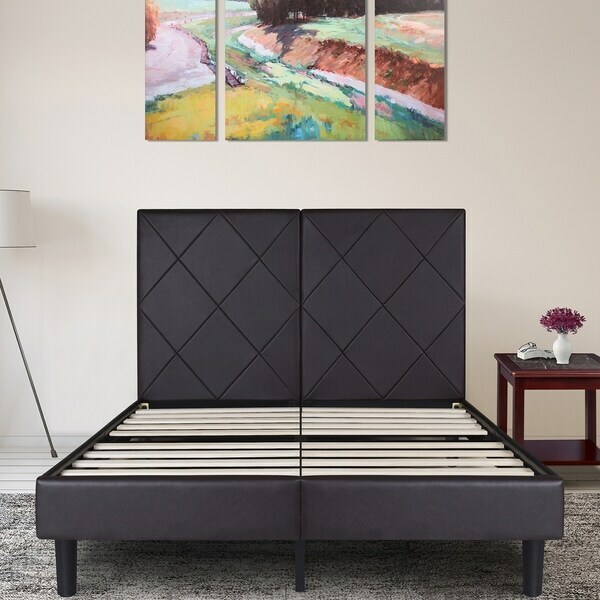 Sleeplanner 14-inch Dura Metal Bed Frame with Brown Rhombus Faux Leather Headboard - luxury headboard made of premium faux leather will be an perfect upgrade for your bedroom. Dimensions 63.0 In. X 85.0 In. X 50.0 In. 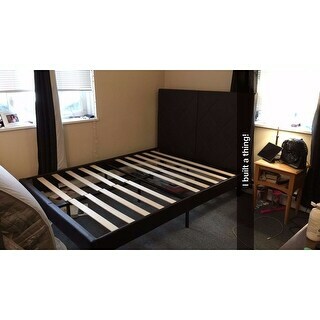 This bed came very quickly, over a week before the expected shipping date which was great. The hardest part was honestly just getting it out of the packaging. There's plenty of room for storage under the bed. You definitely don't need a box spring, but I didn't want to get rid of mine. It is a little tall, but I'm tall so it works! Unfortunately, the bag that contained the screws and nuts broke open during shipping. They were everywhere inside the headboard. Upon putting it together I realized it was missing 2 small screws and 1 nut, so I had to take them out of another part of the frame to make due. I also noticed it arrived with a gash in some of the faux leather on the footboard which was disappointing. The assembly wasn't difficult by any means, it was just time consuming. The directions are very basic, but overall clear. It would definitely go faster with 2 people, but by myself it took about 2 hours including putting my mattress back on and making the bed. This is great quality and perfect size. Great leather. Obviously not real but it is great quality. I needed a new bed and this was the one. Thank you so much overstock! I was a little leery about buying a bed and frame online, but not anymore. This bed and frame exceeded my expectations. It was easy, it is so durable and stable and I have the utmost confidence in this product now that I have seen it, assembled it and slept on it. It's also looks beautiful. Well worth the price I paid. I didn't even have to leave my home to search for something comparable at furniture stores. I recieved this purchase very promptly. Very sturdy bed and easy to put together. 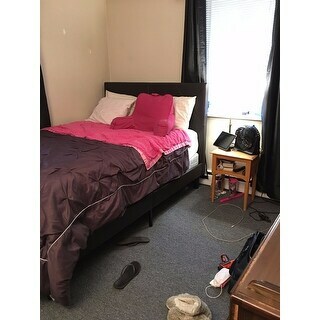 Overall very satisfied and would definitely recommend this bed. This bed frame was super easy to build and it ended up being very sturdy. I was worried about my mattress being too heavy, but it has worked out great. It looks even better than the picture. Surprisingly solid once assembled. You need 2 people to assemble it and but the instructions are clear. 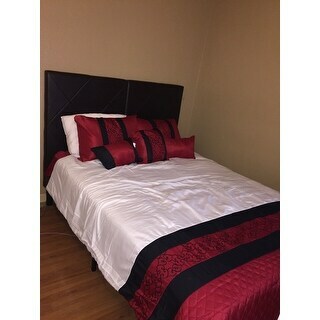 It is a nice looking bed for the price point. No squeaking so far. This bed went into my sons room. The color wasn’t what I expected when it arrived but I made it work. My son likes it. I will definitely order another mattress. Very easy to put together, love how sturdy it is. Easy enough to put together and looks great but not very durable. Frame broke almost immediately. Also is very loud. Any sort of movement cause it to make all kinds of noise. Just out this bed up today, my dad helped me it was really easy to put together once he understood the directions. It took about 2 hours. I love it so far, keep in mind the box it comes in is really heavy about 70 pounds. So just Fyi make sure there’s someone there to help you get it to your room.